Here’s how to generate transcripts with the Google Speech to Text api. I’m providing instructions for running this on a micro debian instance on Google Cloud Compute Engine. Here’s how to download an interview Tyler Cowen did with Malcolm Gladwell. 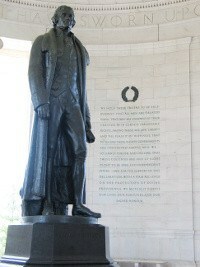 Although it looks as though the text etched into Panel Three of the Jefferson Memorial is a single quotation from Jefferson, it actually is a compilation of 6 separate quotations. Can you see what was lost when the context of each excerpt was stripped away? It “would deprive the United States of the figure central to what is singular and most admirable about the promise of American life — a promise that is already largely forgotten. Jefferson was a complex man. What he takes away with one hand, he gives with another. In the Jefferson Memorial the southeast panel advocating laws and institutions change with “progress of the human mind” appears opposite the northeast panel with the cherry-picked quote about deportation. View the full-sized panoramic photo of the Memorial to inspect the inscriptions and see both panels side by side. I released an updated version of the wordpress plugin tonight. This version handles the filename hashing a little bit differently. It escapes a list of characters such as apostrophes and quotation marks that can be problematic. The basic functionality is now working pretty well, but the performance needs to be improved for pages that include multiple citations on a single page. The web service also has a memory leak that needs to be patched before it is really ready for prime time. Some Americans have become so disillusioned with the mainstream press that they refuse to trust basic reporting, assuming that even direct quotations may have been taken out of context. Cherry-picked quotations are an old problem, but one which digital tools are uniquely suited to combat. In this article I’m going to demonstrate how a new set of authoring tools I’ve developed can allow authors to establish greater credibility, by providing readers the additional context they need to quickly evaluate a quotation’s context. Nothing is more certainly written in the book of fate than that these people are to be free. Quotations that appear in print are frequently devoid of context, requiring the reader to trust the author or follow a footnote. I call these “severed quotations” because the context necessary for readers to evaluate them has been chopped off. I use the term “severed” as a way to suggest that we need to establish a new norm for quotations — a norm which the digital medium has only now made possible, where the text surrounding a quotation can be expanded to provide readers with a fuller context. This new norm can help readers distinguish between those authors who desire to live to a higher standard of accountability, from those who play fast and lose with the record. This line was actually a exaggerated paraphrase from Sarah Palin that makes more sense if you read the original ABC News interview’s full transcript. If media outlets want to distinguish themselves from the competition, one visible way of doing this would be to adopt the sort of expanding quotations I’ve demonstrated and coupling this with a campaign to regain public trust. I created the open-source Neotext project as a way to demonstrate the technical feasibility of this form of expanding quotations, and as a project to develop working implementations on many platforms. You can experience what it is like to create your own Neotext quotations on my demo site by clicking on the “Test Drive” button below. 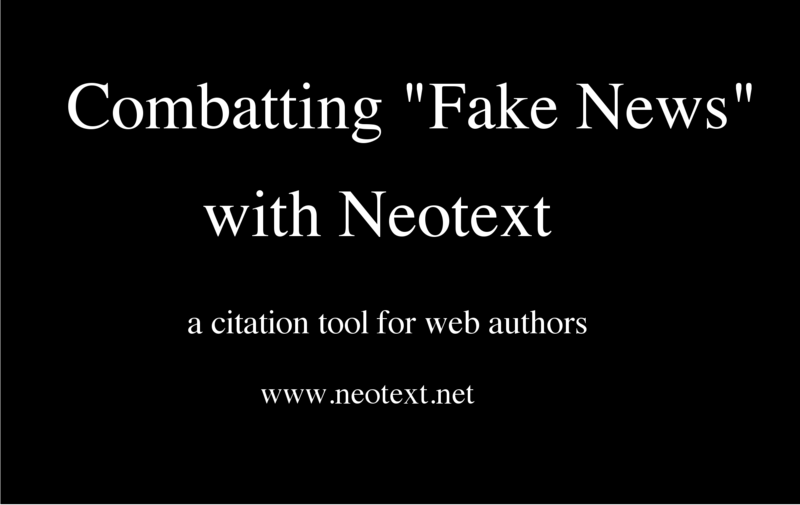 The goal of the Neotext project is to provide authors with tools that allow their readers to make an informed evaluation of sources, and to inspire greater confidence in the works of authors who are willing to hold themselves to a higher standard of accountability. I’ve made all the code for Neotext open source (MIT) in the hope that a free license will speed Neotext’s adoption by authoring platforms like Medium. incorporated a citation web service, like the one I developed. I’ve created the above prototype as a proof of concept using a custom jquery library and Python web service to demonstrate how this idea could be implemented as a WordPress plugin. Neotext is currently alpha-quality code, but all the code is free to build off of and is available under an open source license (MIT) at GitHub. If you work at Medium.com and you want to implement this functionality, you’re free to build off of my MIT-licensed code. Contact me if you want to discuss collaborating. WordPress authors who are interested in being alpha-testers of my plugin. If you’re interested in staying up to date with the latest news, join my email newsletter or subscribe to the RSS feed. When the article is published, the Web Authoring Tool (either WordPress or Medium) scans published articles and checks to see if the article contains a <blockquote cite= “url”> tag. If the article does, it uses the HTTP POST command to programmatically send the article’s url to the Python web service I created. locates the quotation starting postion. After the web service locates the quotation, it copies the 500 characters of text before and after the quotation. The web service saves the 500-character contextual text snippets to a json file on Amazon S3, constructing an identifier from a hash of the quoted text and the page’s url. My goal is to bring this functionality to every significant online writing platform. Medium could strengthen the credibility of its platform by being an early adopter. Journalists and Technologists Should Collaborate to Build More Trustworthy Media, which I also wrote. Review: Ted Nelson’s Philosophy of Hypertext: I was inspired while writing this article to create Neotext, as a way to evoke and eventually transition to a hypertext more like Nelson’s original vision. Contact me if you’re interested in helping with the programming or UI, or check out the project website or Github code. A new version of the WordPress Plugin is out which uses HTTPS to communicate with the Amazon Cloud. Last month I posted an article I wrote about how Fake News, in the form of Out-of-Context Quotations, is not a new issue, but the internet poses both challanges and opportunities. I described 2 examples of how media sources in 1999 and 2008 took quotations by Al Gore and Sarah Palin out of context and how this could be prevented if media outlets used Neotext. I also expanded the concept of quote context to video and laid out 3 challenges to technologists. Here’s a progress report on where things stand. Most of the time both sets of code produce the same result, but there are some cases when they do not, which prevents the client from finding the generated json file. Before I go too much further, I’d also like to switch the hash algorithm from sha1 to something like sha256. This should be a fairly simple switch because I had planned for the hash algorithm to be swappable, without breaking backwards compatibility. Feature: Add neotext to the Preview/Publish system so that the user doesn’t have to visit write.CiteIt.net and submit a new url. I think this is possible, I just have to research the WordPress API. One optimization I’d also like to do is detect whether a “cite” attribute has been used so the webservice doesn’t run unnecessarily. Question: Say I neotextify a page and then later I decide I don’t want the expanding quote contexts in that article. Is there an easy non-technical way I can turn off the neotext plugin for just one page in WordPress? Answer: You can remove the neotext by removing the “cite” attribute from the html. Perhaps there could be a way to do this with the GUI. Bug: The headings in the context for my quote are run together with no space between the surrounding text and the heading. Feature: The context expansion arrows should flip to point the opposite direction when expanded. If you have further suggestions send them my way. My gmail account is timlangeman. If I like them, I’ll have you add them to the Github issues pages. I recently completed a section of the site that allows Neotext users to generate neotexts for quotes hosted on their websites. View the quote source to verify the “cite” attribute is filled in.